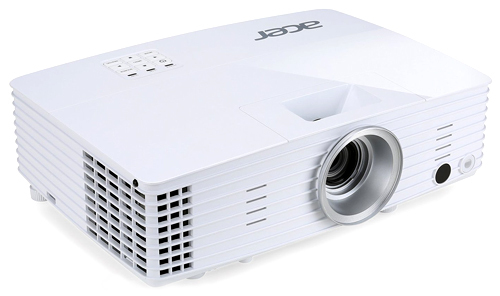 The Acer H6502BD delivers a 3400-lumen rating for $699 or less, making it one of the brightest full HD (1920x1080) home theater projectors for the price. The H6502BD is enough of a light canon to throw a 160" diagonal 16:9 image with moderate ambient light. If you're into gaming you'll appreciate the reasonably fast 33ms lag time. And although you can connect to an external sound system, you don't have to. The 10-watt speaker offers good sound quality and high enough volume to fill a small to mid-size family room. The Acer H6502BD comes with two HDMI ports with MHL, and you can pick up a optional Wi-Fi dongle for an extra $69. The H6502BD has six factory predefined color modes - Bright, Standard, Movie, Dark Cinema, Game, and Sport. All of these except Bright deliver vibrant, saturated color and a relatively neutral gray scale, and they share similar color quality and brightness levels in lumens. However, you'll need to experiment to find the one that you like best, since they differ in other ways. Some do a better job holding shadow detail, for example, but give colors in well-lit scenes a less saturated look. The H6502BD also does well in most modes with grayscale images like black and white movies. In particular, Standard, Game, and Sport deliver neutral grays at all levels from black to white. Movie mode, and Dark Cinema to a lesser extent, are a touch warmer but equally so at all gray levels. As with most projectors, the Bright mode (which is indeed the brightest of the six) has an obvious green bias, so that even yellow objects show a distinctly greenish tint. In addition to the six factory preset modes, the H6502BD offers one customizable color mode that you can use to tweak the picture as you wish. However, if you program the User mode, then change a setting in any of the preset modes it overwrites the single User mode. I saw more digital noise with the H6502BD than typical, but there was little enough that most people shouldn't find it bothersome. In video test clips that have so much noise that it shows with almost any projector, however, it was obvious enough that some might consider it annoying. On the plus side, the Acer H6502BD scores well on rainbow artifacts. I saw very few with color content. They show more often with black and white, as is common for single-chip DLP projectors. Keep in mind, however, that the tradeoff for a single-chip design is that it guarantees chips can't be misaligned, as can happen with three-chip light engines. 3D Video. This projector's 3D support is for DLP-Link glasses only. Image quality is much the same as for 2D for those aspects that both share and is acceptable or better for 3D-specific issues. I didn't see any crosstalk. With respect to brightness, although 3D is always dimmer than 2D, the difference was less on the H6502BD than with some models. In particularly demanding clips, 3D-related motion artifacts are a little more obvious than with most projectors, but not by much. Overall, this projector turns in a solid 3D performance for the money. Data Presentations. The H6502BD does a good job with data and graphic presentations. Since it weighs only 5.3 pounds and comes with a soft carrying case, it can easily double for business and home use. With data signals, in most color modes the colors are eye-catching and nicely-saturated. The exception is Bright mode, because of its green bias and the equally common tendency for some colors to look dark in the brightest mode. Rainbow artifacts show even less often with data and graphics than with video, and the image holds detail well. In my tests, white text on black was highly readable at 6.0 points. Black text on white was readable at 4.5 points. Is it my imagination, or are the home theater projector companies not bringing out new projectors like they used to? For example, Panasonic has not brought out a new projector in a few years.